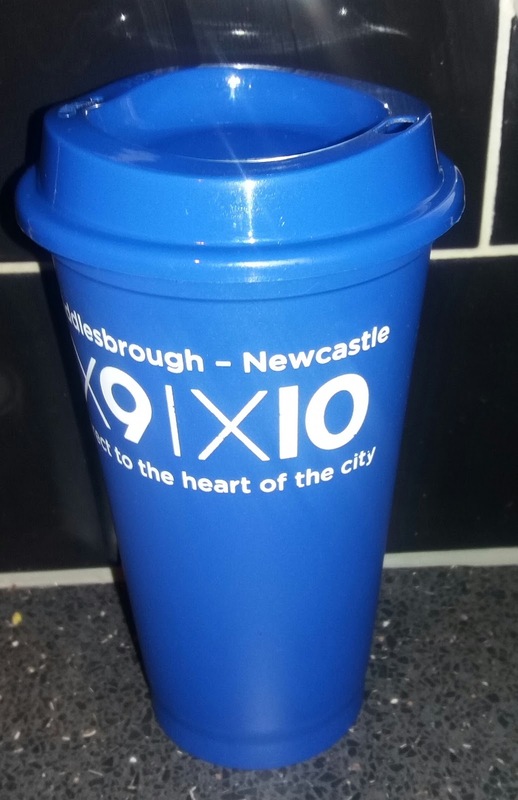 For a while, I 've wanted a new travel mug to have a cuppa before work. My other ones are either broken or the fairies have borrowed. (Translation I've lost them) . Sometimes with patience, the universe has a strange way of providing for me. I won a free promotional travel mug on a promotion for a new bus service. 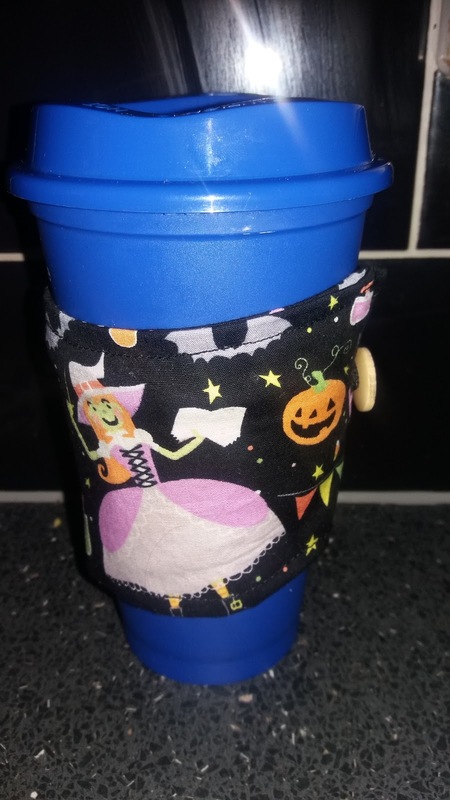 The mugs great, however, the mug can get extremely hot and since I don't have milk in my tea even if I add water it often hurts my hand. 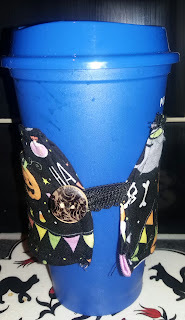 I decide to sew a travel cup sleeve. 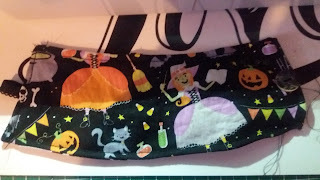 I decided to make a mug mitten and since it's Halloween, it seemed appropriate to use my Halloween fabric. I downloaded a free sewing coffee sleeve from Craftsy. Click on the link for it.) However, this one has no instructions. 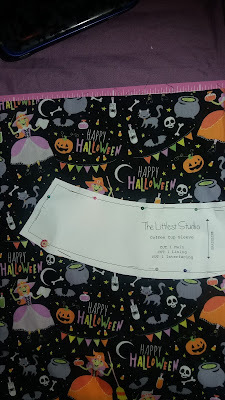 I pinned the sewing pattern and cut out the fabric while measuring the grain line and ensuring it was the same distance from the salvage line. 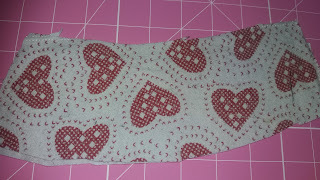 I ironed on the interfacing to add more structure to the fabric. I sewed a narrow seam using a zipper foot and the narrow edge of the sewing plate as a guide for the seam. 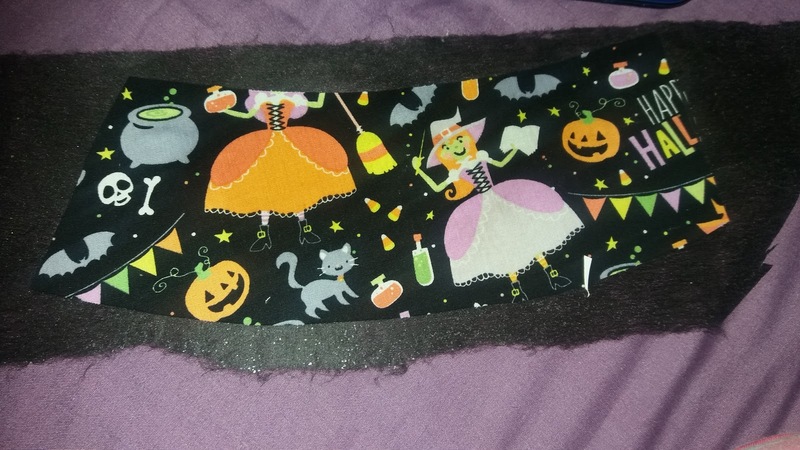 For the inside of the seam, I left on seam elastic. could insert the elastic. I pulled the sleeve to the right side. For the lining, I sewed it together trimmed the edges and insert into the sleeve. 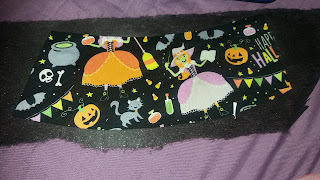 I folded the un-sewn edge by folding the edges in side, pinned together, inserted some elastic sewn and sewn shut. I hand sewed a button on the sleeve. 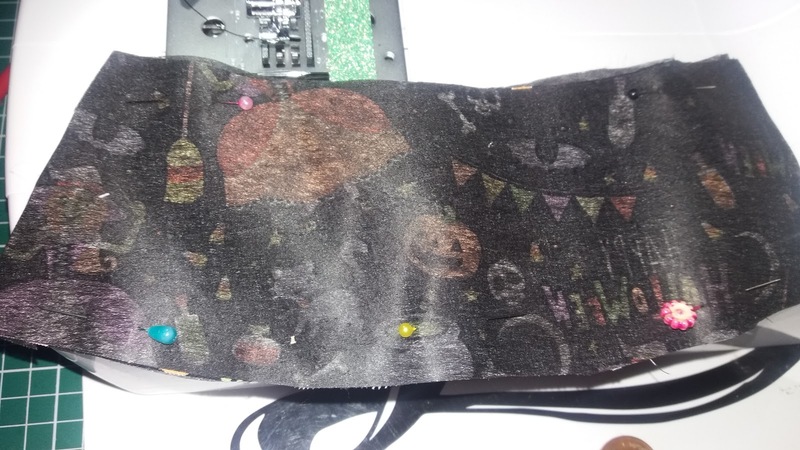 I top stitched all the sleeve. This is the final result, I'm very happy with it but it feels more like me. 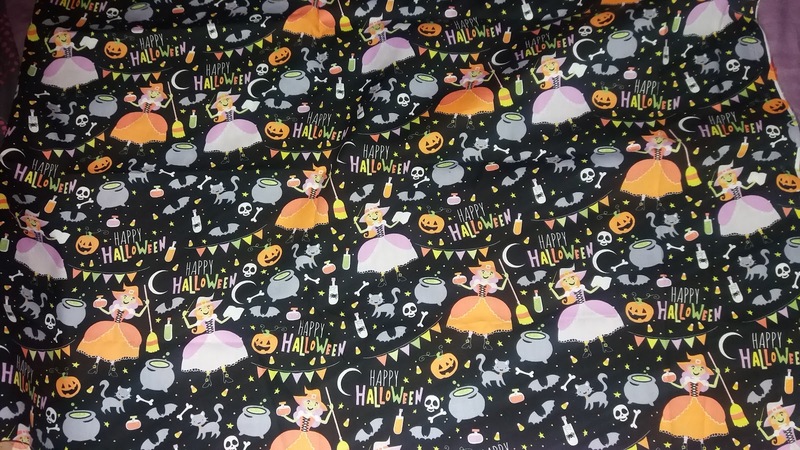 Since it didn't have instruction I actually cut the pattern the wrong way. 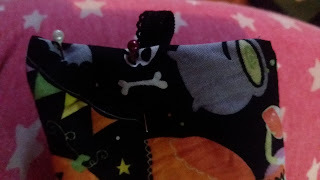 So I would recommend turning the pattern upside down so the writing will be upside down or it'll look like this. It does look odd. but I don't care, after using the sleeves it far more comfortable to hold. I would also recommend adding between 1.5 to 2 cm around the paper pattern. Thanks. 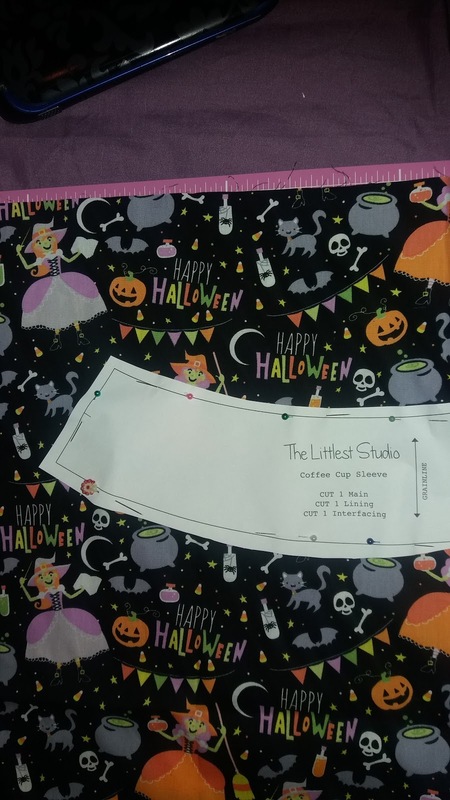 Its an easy oops to that has no impact on the sleeve but it works. lol. Its nice to know its not just me making mistakes but I've been sewing for over 7 / 8 years now I should know better. At least it still does the job that what's important. 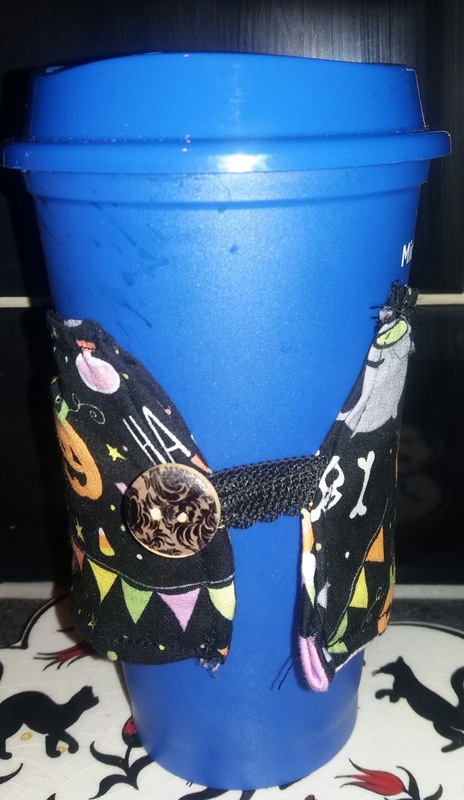 Its really cute and I think the button makes it even more so, like a nice cup sweater! Ahh even with the tiny mistake, this looks adorable! I really want to get into sewing with a machine, but I have absolutely no idea where to start. This little project looks like it would be fairly simple to start off with though! Thanks. 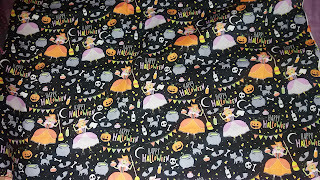 I love nice Halloween fabric I know people who use these kind of pattern to make clothes out of for me its a bit garish. I tend use more sedate patterns. 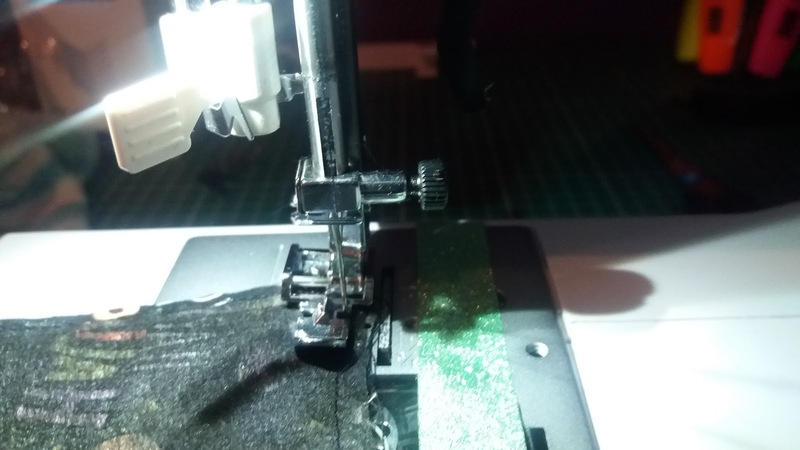 I would first recommend signing up for sewing classes to learn the basic there is a lot around. Usually these class provide sewing machines. I would personally recommend with WEA in Newcastle or where at Bensham Grove, actually we're looking for another member for this term . It 10 week course Lynn is an amazing tutor. She taught me .